I bought the cutest angel yesterday and I was not sure what I was going to do with her. But she was perfect for my home and was so me that I could not resist. Well, when I got home and sat her on my kitchen island I then knew exactly what her job was going to be. Meet my new Sink Angel! Her wings hold up my dish cloth perfectly! It is so nice not to have the dish cloth draped over my wonderful farm sink that I paid mucho $$$$$ for!! Now for the a more practical buy. We have the worst time with potatoes and onions spoiling. I know that I should keep them in my basement where it's cool but dear Joe refuses to walk up and down stairs for anything if it can be avoided. I was scanning the Lillian Vernon Catalog and I saw Stay Fresh Potatoes and Onions Bags and they claimed to prevent sprouting and rotting . Of course I was skeptical but I ordered the set and hoped for the best. When I received the bags, which are very nicely made, I decided to just try out the Potato Bag to see if it really worked. I'll be darned, it's been over 8 months and we've not had 1 potato go bad! However the bag does not prevent spouting but anything that helps eliminate the stench of rotten potatoes is a winner as far as I'm concerned. 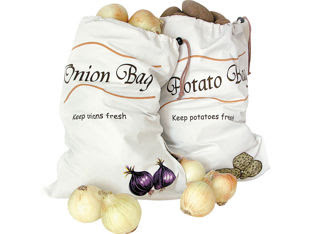 I can't wait to try out the Onion Bag!!! Michelle, I've been using veggie bags for years now and just love them. I've had them for so long, can't remember where they came from, but a wonderful investment. It's Snowing inside and out! !